These cards are VERY specific to the Realidades Textbook. Each card uses a vocabulary word (or words) from THE LIST to form a question that the students can answer creatively in the given scenario. 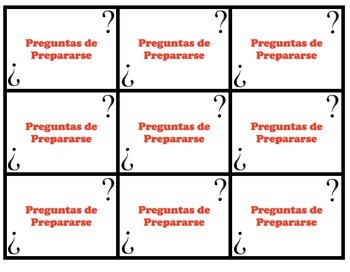 These cards were created to allow students to hear and/or speak each vocabulary word from the list in Spanish. If you do not use the Realidades textbook, please do not give a bad review of this product if it does not match your vocabulary needs. Pairs (or groups) of students are given a set of cards. They take turns asking each other the vocabulary-related questions and responding appropriately in Spanish. 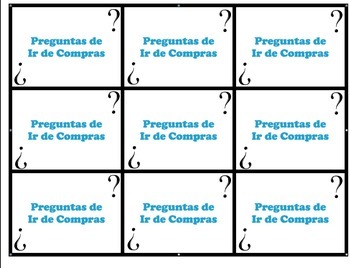 Each set uses the specific vocabulary from the Getting Ready / Shopping chapters in the Realidades 2 Textbook. 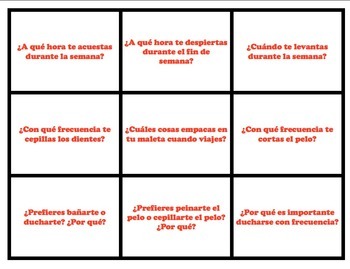 Some questions set students up to answer using specific vocabulary from the textbook. This is good for getting oral practice with the vocabulary terms when you can't get all of the vocabulary in through TPRS. Of course, these cards can also be used without the Realidades 2 Textbook, but they were created with that curriculum in mind. I print out multiple sets for each group of students, cut them out and laminate them, and use them during the appropriate vocabulary section for some student speaking practice. They can also be used to do a speaking assessment by the teacher. By no means am I perfect. If there was a simple error in the product, for example, a typo or grammar mistake, or something of this nature, please email me at Clarke_Alyssa02@yahoo.com to fix it for you before leaving a bad comment or rating. Thanks!